Malado Traoré had a lot of firsts last month. In early May, Malado learned her condition could be treated, something she had never been told in the 30-some years she lived with an obstetric fistula. Early last week, she received her first, and hopefully last, fistula repair surgery at Koulikoro Referral Health Center (or CSRef). And a few days later, she met Aminata Maïga Keita, the First Lady of Mali. 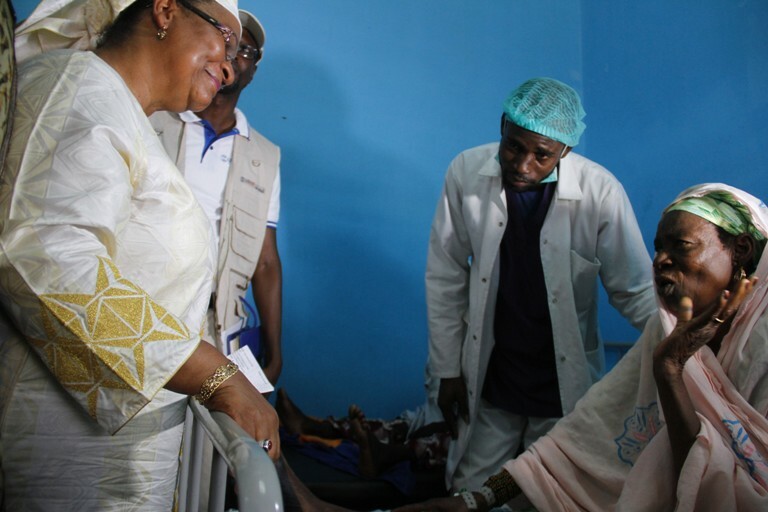 In a celebration of the International Day to End Obstetric Fistula, the First Lady visited fistula clients bedside in Koulikoro. "Before it can be a battle for all,” the First Lady said, “fistula must be a battle for women.” I agree. As an American woman, I am protected from this condition because of access to family planning and emergency obstetric care. This condition is associated with poverty and limited decision-making power, and I am drawn to stand by these women. Malado developed her fistula following prolonged labor during her first pregnancy, and, as is often the case, her baby was stillborn. She was lucky enough to have one daughter after she developed the fistula, and this daughter’s daughter—her granddaughter—learned about the repair campaign and brought her to the Koulikoro CSRef. No one in her village knew the condition was treatable. Everyone there will be shocked when she comes home cured, she says.Bringing a fistula campaign to Koulikoro CSRef marks a milestone that could not have happened without synergy across a variety of partners and champions. This repair campaign was not only the first campaign in Koulikoro, it was the first campaign in a CSRef rather than a national or regional hospital. This marked an important step in bringing fistula services closer to the women who need them. Toward the end of the ceremony, the First Lady gave one of Inner Wheel’s dignity kits to a woman suffering from fistula. The client thanked the First Lady for her dedication and for coming to visit them in Koulikoro. The women were flattered and reassured by the First Lady’s visit. They talked of feeling certain that her involvement would not stop there and their belief in her commitment to fight for the goal of zero cases of fistula in Mali. “There is a time for sickness, and there is a time to be healed,” said Malado.